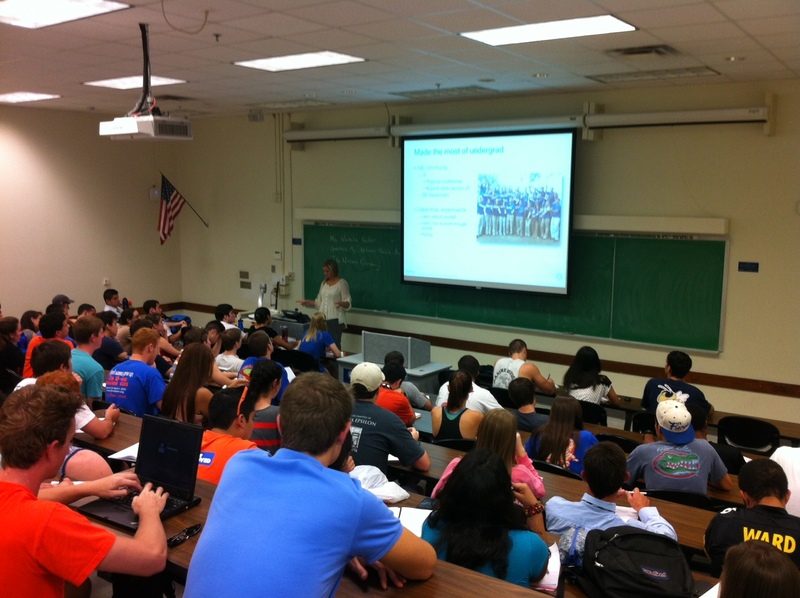 GAINESVILLE, FL: Participating in the inaugural meeting for the Young Alumni Advisory Board over the weekend, Natalie Keller (BS ISE 2010) stayed until Monday to address students in the “Introduction to ISE” course on Tuesday, October 8. She urged students to get involved in organizations early and stay involved with the Department after graduation. “There are many benefits to staying involved long term,” said Keller. Keller, an active memberof IIE as a student who interned at both Disney and Oldcastle, entered Nielsen’s Emerging Leaders program upon graduation. She completed assignments in Tampa, FL, Bentonville, AR, and Chennai, India and is now the Operations Manager of Walmart and Sam’s Club accounts for Nielsen in Arkansas.